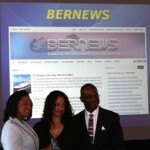 Bernews is pleased to rather obnoxiously inform our readers that this afternoon we won the Bermuda Government’s Techweek ‘Best Local Website’ award. The awards are designed to showcase the best of local technology, and there were 153 nominees for 14 awards in 2010, a doubling of the 2009 nominees. The awards were presented by special guest Christyl C. Johnson, a NASA official and Executive Director of the National Science and Technology Council of the White House, and Minister of Energy, Telecommunications and E-Commerce Michael Scott. The category we won is described as “A local website that is successful, innovative and evolving to meet the increasing sophistication of the market.” It was a great way to cap off the end of our second month, and we extend our thanks to the Techweek organizers. The awards were presented today at a luncheon at Hamilton Princess, which was hosted by business writer Roger Crombie, who began the event by greeting the audience with “Good Afternoon nerds”. Always amusing, Mr Crombie said “Although I work for the Royal Gazette, I recommend everyone spend hours a day on Bernews“. Later during the event, Mr Crombie stopped talking and said he was receiving an important message from Colonel Burch, which he then passed onto the audience…the Colonel said Bermudians can only look at one foreign website a day. This was greeted by much amusement by most in attendance, including Minister Michael Scott. Other award winners included: Cedarbridge teacher Teresa Harper who was awarded the Most Inspiring Technology teacher, Easypark.bm who won Local Innovation of the Year, the Bermuda Police Service who won for Best Use of Social Media, and Nova Quantum for International Innovation of the Year. The presence of Deputy Police Commissioner Mike Jackman along with the Media Relations staff to receive the Bermuda Police’s award offered comfort as Bernews staff had “abandoned” work for a few hours to attend the luncheon. We did however assume if any major breaking news occurred we would be notified as the Police would sprint out the door…with us hot on their heels. The loudest applause of the day was given to two winners who impressed everyone in attendance, and were clearly the most popular of the day. The two winners, both teenagers who are students of BHS senior year, won the Most Innovative Youth Project. Emmanuel Smith-Joynes and Alexander Thompson developed a website Axiomgaming.net that started as a gaming website designed to fill a void as gamers in Bermuda were isolated. The impressive pair, aged 17 and 18, expanded the website from gaming, and now offer services including website design, computer repairs and more. The judges were Dr. Barrington Brown, Dr. Eugenie Simmons, Chris Worboys, Edgar Dill, Jennifer Burland Adams, Jim Ivey, John Narraway, Michael Branco, Pat Callender, Paul Kirpalani, Sara Jackson, Sandra De Silva, Stephen Davidson and the judging coordinator, Marisa Stones. Congrats to the Bernews team!! At first I was skeptical of the site as I believed it was the govt news medium that the current administration talked of implementing and was expecting unbridled propaganda. But I must say that scepticism has now been eliminated completely through the excellent and completely unbiased reporting on the numerous issues locally and overseas affecting BDA and her people. If I can make one request that would be to include more historic articles of Bermuda (i.e. the Havana airlines crash in the ’50s etc. posted last week) as I love to learn more about my country’s rich history. Thanks and keep up the excellent work Bernews!!! We must admit to being rather excited lol….the free lunch didn’t hurt our mood either. Is there any association with your “Bernews” and the Workers Voice?